Brian Wilson #38 and catcher Buster Posey #28 of the San Francisco Giants celebrate with their teammates after the Giants won 3-1 against the Texas Rangers in Game Five of the 2010 MLB World Series at Rangers Ballpark in Arlington on November 1, 2010 in Arlington, Texas. It was a fitting way to end the World Series that followed a season dubbed "The Year of the Pitcher." Cliff Lee and Tim Lincecum, with three Cy Youngs and two stellar 2010 postseasons between them, hooked up for a classic pitcher's duel that saw the game scoreless into the seventh inning. Both men were on top of their games, a welcome change from their sloppy Game One matchup, but it wasn't easy to go into full enjoyment mode because you knew that one of them would blink first and help his team lose the game. If it was Lee, it would mean the end of the baseball season -- never fun, no matter who you root for -- and, possibly, the end of his run in Texas. If it was Lincecum, it would mean two days of doubts to creep into the heads of San Francisco fans who have been waiting 52 years for a World Series champion (or Giants fans of any locale that have waited the full 56 years) that actually won the thing while wearing the uniform of their city. Two rough options, although we should have known that it was going to be Lee who went down to defeat the second Edgar Renteria strode to the plate with two on and two out in the top of the seventh inning. Edgar Renteria plays for the Giants, you see, and he has a knack for making memorable plays in key spots of World Series games. In 1997, Renteria's 11th inning single for the Marlins beat the Indians and lifted the expansion team to their first world title. In 2004, playing for the Cardinals, Renteria grounded out against Keith Foulke to end a Red Sox drought that lasted a lot longer than San Francisco's. Tonight, Renteria jumped all over a hanging breaking ball from Lee and drove it over the left field fence to come up with the second World Series-winning hit of his career. That puts him in the company of Lou Gehrig, Joe DiMaggio and Yogi Berra which is quite a group to join for a player who had to wait 13 years between chances. Renteria was named the World Series MVP after the game, an honor he certainly earned with his .412 batting average and two home runs but one that somehow feels wrong based on the way the Giants pitched all series and especially with the way Lincecum pitched on Monday night. He would stumble in the bottom of the seventh, allowing a home run to Nelson Cruz, but he bounced back with two strike outs to end that inning and cruise through eight innings of the 3-1 win. He finished with a three-hitter, striking out 10 and walking just two en route to the biggest win by a Giants pitcher since Don Liddle finished off a sweep of the Indians back in 1954. It's hard to come up with too many better starts to a career than Lincecum's. He's got two Cy Young Awards and a win in a World Series clincher within his first four years and could add more of each as the front man for a very strong rotation that plays its home games in a very good park for hurlers. The Freak is already absurdly popular by the bay, Monday night may very well have made him an icon on par with Montana, Mays and Garcia. As for the Rangers, it was a fantastic run that simply couldn't sustain itself against a staff that pitched as well as the Rangers did over these five games. You can harp on some bad moments for Ron Washington and wonder just what happened to Josh Hamilton, but the fact of the matter is that it is hard to imagine any team hanging with the Giants of the past week. The good news is that they've settled their ownership issues and seem poised to build on this year's success by leveraging their strong market with a smart front office and solid core of returning players. This year ended badly, but it was the best in the history of their franchise and that's something worth celebrating. That celebration will pale in comparison to the one going on in the Haight, along Market Street and everywhere else in San Francisco right now, however. All season long, Giants fans have been subjected to close, anxious games that were widely described as torture. 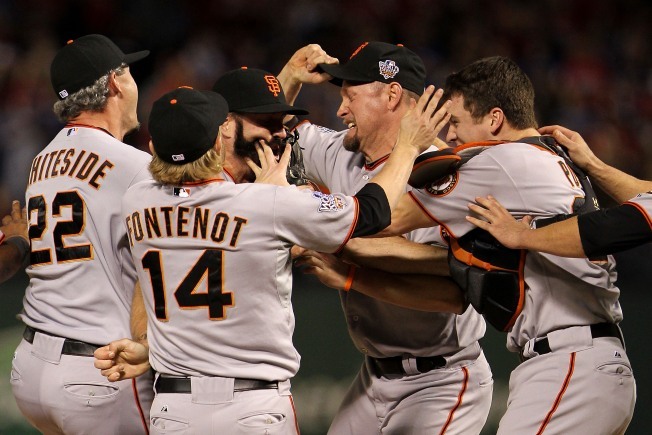 It's the kind of torture that they would surely sign up for again next season, because the San Francisco Giants are finally World Champions and all is right with their world.